Psalm 148, in which all of creation is called upon to give praise to the Almighty, very neatly divides into two clear, distinct sections, corresponding to the two segments of the universe. Verses 1-6 address the upper spheres – the angels, heavens and celestial bodies – while verses 7-13 are directed to the creatures on earth. David thus emphasizes the all-inclusive nature of his summons; all creatures, all beings, all entities, and all natural forces in all regions and strata of the universe, must give praise to God. The upper spheres are enjoined to praise the Almighty "because He commanded – and they were created" (verse 5); meaning, their very being testifies to the existence and unlimited power of the Creator. The creatures in the lower world must praise God "because His Name alone is exalted" (verse 13). Although certain people have achieved widespread fame, prominence and authority, these achievements pale in comparison to the unchallenged greatness of the Almighty, and thus only He – as opposed to human kings and dignitaries – can be truly "exalted." Verse 13 concludes with the declaration, "Hodo Al Eretz Ve'shamayim" – "His majesty is upon the earth and the heavens" – which effectively summarizes the basic theme of this Psalm. God's power and glory are manifest throughout the entire universe; it was all created by Him and remains eternally under His authority and jurisdiction. There is thus not a single molecule in the universe that does not "give praise" to God in the sense of expressing His infinite power and wisdom. The final verse of this chapter speaks of "the rising of the banner" of Am Yisrael, which brought widespread admiration and respect for the righteous and God-fearing among the Jewish nation. This verse is written in the past tense, which indicates that this Psalm refers to the Messianic era, when Am Yisrael have returned to their previous state of glory and splendor in their ancient homeland and with the rebuilt Bet Ha'mikdash. 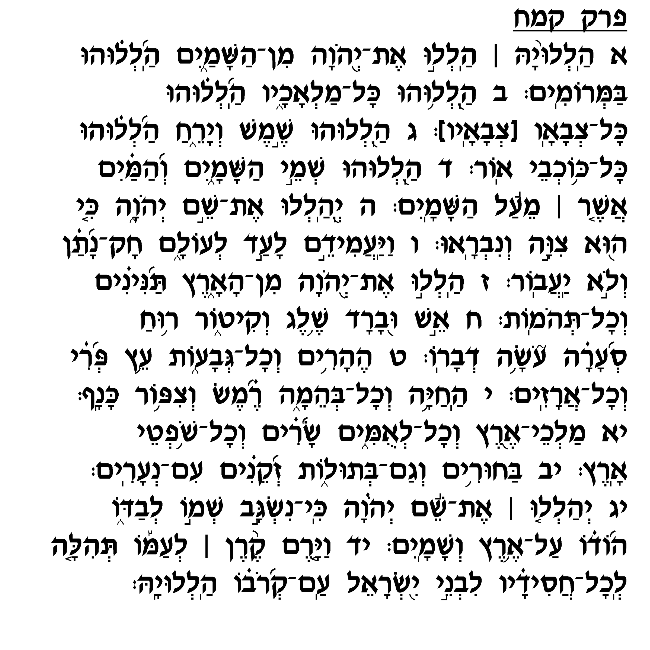 As the Radak explains, it was at this time that the entire world finally recognized the theme of this Psalm – God's unlimited power and rule over the universe. Whereas during the period of exile it appears as though the world's affairs run themselves arbitrarily and by chance, the time will come when the notion of "Hodo Al Eretz Ve'shamayim" will be universally recognized and unchallenged.